Background: Alleviating pain is of utmost importance when treating patients with endodontic pain. Aim: To compare and evaluate the efficacy of two modes of delivery of pretreatment Piroxicam (Dolonex®, Pfizer) for the management of postendodontic pain. 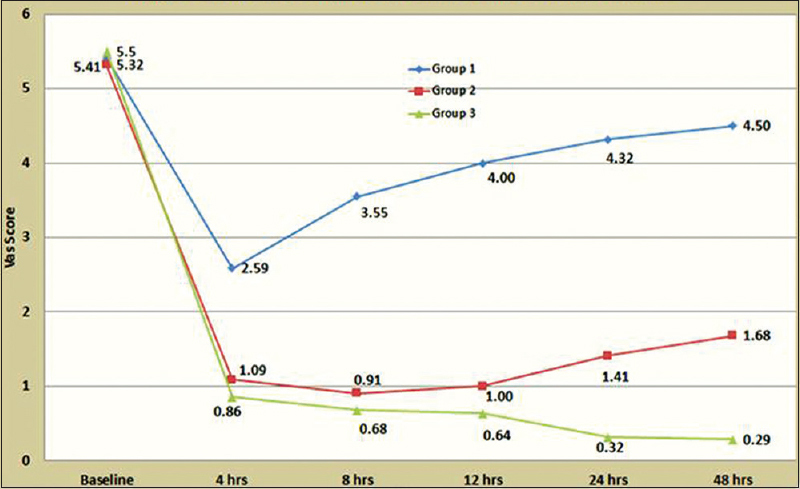 Materials and Methods: Sixty-six patients with symptomatic irreversible pulpitis were randomly divided into three groups of 22 subjects Group I - control group, no pharmacological intervention, Group II - patients received pretreatment oral Piroxicam (40 mg), Group III - patients received pretreatment intraligamentary injections totaling 0.4 mL of Piroxicam. Single visit endodontic therapy was performed by a single endodontist. Visual analogue scale was used to record pain before treatment and 4, 8, 12, 24, and 48 h postoperatively. Mann–Whitney U-test and Kruskal–Wallis tests were used to analyze the data. 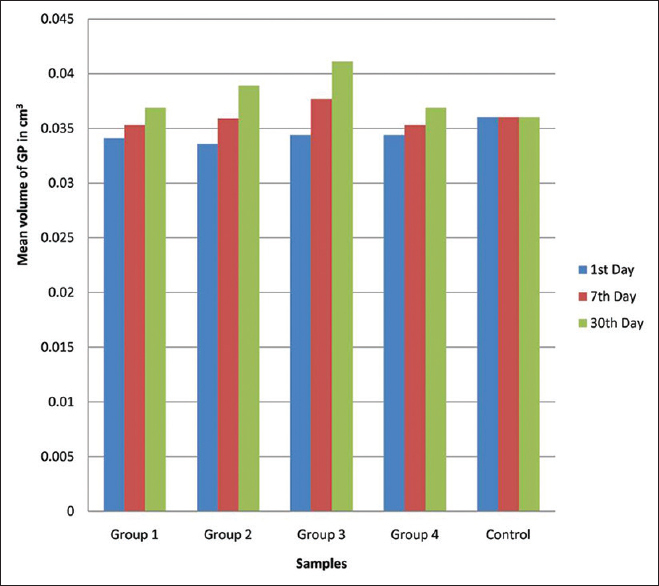 Results: The patients in Groups II and III perceived less postendodontic pain as compared to Group I (P < 0.05), at all the time intervals. At 12, 24, and 48 h, pain experience in patients of Group III was significantly less. Conclusions: Intraligamentary mode of delivery of Piroxicam was more efficacious. Background: Clinical evaluations as fundamental method to prove the efficiency of restorative materials. Aim: This study evaluated the clinical performance of restorative systems during 2 years of clinical service. Materials and Methods: This study assessed the clinical performance of restorative systems (Filtek Z250 and P60), during 2 years of clinical service, using the US Public Health Service system. The randomized and double-blind study comprising thirty volunteers. The restorations were evaluated at baseline, 6, 12, and 24 months. It was used the following criteria: marginal discoloration (MD), marginal integrity (MI), superficial texture (ST), wear (W), postoperative sensitivity (PS) and recurrent caries (RC). Results: Statistic analysis was performed using Fisher's and McNemar's exact tests and Pearsons's Chi-square in a significance level of 5%. The results at baseline and 24 months for Group I were: MD – 100, 100%; MI – 100, 88.6%; ST – 100, 94.3%; W – 100, 94.3%; PS – 100, 100%; RC – 100, 100%, of alpha scores; Group II: MD – 100, 97.1%; MI – 100, 91.4%; ST – 100, 94.3%; W – 100, 91.4%; PS – 100, 100%; RC – 100, 100%, of alpha scores. It was observed no statistical difference in the evaluated criteria and period. Conclusions: After 24 months of evaluation, both restorative systems exhibited acceptable clinical performance. Aim: This randomized, controlled trial evaluated the incidence of postinstrumentation pain on using two different rotary Ni–Ti and one reciprocating Ni–Ti cleaning and shaping systems. Materials and Methods: Asfter sample size estimation, a total of 152 patients were randomized to three groups (Group WO [WaveOne], Group PU [ProTaper Universal], and Group Mt [Mtwo]). Selection of patients was based on root curvature, periapical lesion, vitality, gender, and diagnosis of the patient. A similar clinical protocol was followed and endodontic treatment was performed. Pre- and post-instrumentation pain scores (2, 4, 6, 8, 12, 36, and 48 h) were recorded using visual analog scale score. Kruskal–Wallis test was done for overall comparison of the groups. Bonferroni-corrected Mann–Whitney test was done for pair-wise comparisons and Friedman test was done to compare pain between time points in each file system (P< 0.05). Results: All preinstrumentation pain values were higher than postinstrumentation pain values (P < 0.05). At 48 h, patients in Group WO experienced more pain compared to the other two groups. Pain scores of nonvital teeth were significantly higher when compared to vital teeth. Among nonvital teeth, patients in Group WO had early onset of pain at 6 h and lasted till 48 h, whereas pain started at 12 h and lasted till 36 and 48 h for Group Mt and Group PU, respectively. 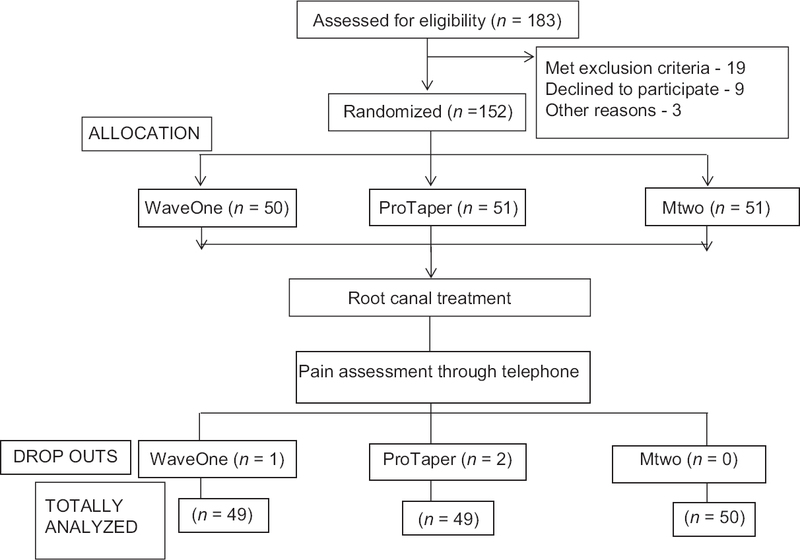 Conclusion: Patients treated with WaveOne files experienced more pain when compared to the other files. Nonvital teeth experienced more pain compared to vital teeth. Group Mt had the lowest postinstrumentation pain. Aim: The purpose of this study was to evaluate the three-dimensional expansion of Gutta-percha (GP), at various powder/liquid ratios, of a zinc oxide-eugenol (ZOE)-based sealer using spiral computed tomography (SCT). Materials and Methods: Thirty-five freshly extracted human mandibular premolars were selected for this study. Cleaning and shaping were performed in all the teeth initially with hand K-files up to #25 and finally with RaCe rotary instruments (25/06). Teeth were randomly divided into five groups of 7 teeth each. Specimens were scanned using SCT. They were then viewed both cross-sectionally and longitudinally, with a constant thickness of 1 mm/slice. The volume of root canal in each tooth was estimated. Obturation was performed by GP points (25/04) and ZOE-based root canal sealer in all groups with different powder-liquid ratio. Groups 1, 2, 3, and 4, had powder/liquid ratio of 1:1, 1:2, 1:3, and 1:4, respectively, while in the control group, no sealer was used. The obturation was performed by sealer coated single cone GP. A second SCT scan was performed to determine the volume of GP and sealer in all four groups 1 day after obturation. The third and fourth SCT scans were taken 7 and 30 days after obturation, respectively. The mean volume of GP per group was calculated. Data were statistically analyzed using one-way ANOVA. Inter-group comparisons were done using Scheffe post hoc multiple comparisons test. Results: All groups with sealer showed expansion of GP at both 7th day and 30th day, which was statistically significant from the GP volume at 1st day. Groups 2 and 3 with powder/liquid ratio of 1:2 and 1:3 gave the highest mean volume values during 30 days period and showed significant expansion in comparison with Groups 1 and 4 with powder/liquid ratio of 1:1 and 1:4, respectively. Conclusion: Increasing the ratio of eugenol in sealer resulted in the volumetric expansion of GP. However, further studies should be performed to confirm the expansion of GP, leading to the achievement of fluid impervious seal. 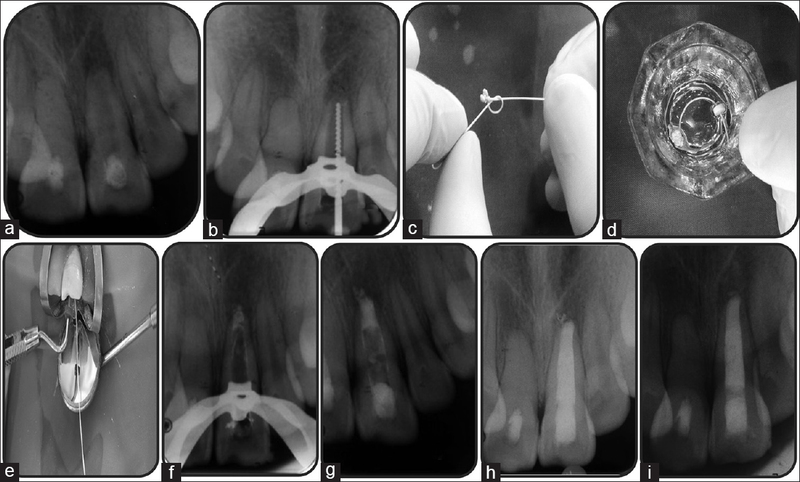 Background: This study evaluated the efficacy of a sonic device (Vibringe), passive ultrasonic irrigation (PUI), and conventional syringe irrigation (CSI) in the removal of triple antibiotic paste (TAP) from artificial standardized grooves in the apical and coronal thirds of a root canal. Materials and Methods: One-hundred eighteen root canals were prepared using the ProTaper system. The roots were split longitudinally, and a standardized groove was prepared in the apical and coronal parts of one segment. The grooves were filled with TAP, and the roots were reassembled. The roots were randomly divided into nine experimental groups and two control groups, according to the following irrigation methods: (1) CSI with sodium hypochlorite (NaOCl) + ethylenediaminetetraacetic acid (EDTA), (2) CSI/EDTA, (3) CSI/NaOCl, (4) PUI/NaOCl + EDTA, (5) PUI/EDTA, (6) PUI/NaOCl, (7) Vibringe/NaOCl + EDTA, (8) Vibringe/EDTA, and (9) Vibringe/NaOCl. The amount of remaining medicament was evaluated under a stereomicroscope. Results: In the apical third, Vibringe/NaOCl + EDTA and PUI/NaOCl + EDTA were superior to the other groups (P < 0.05); there was no significant difference between the other experimental groups (P > 0.05). In the coronal third, there was no significant difference between the experimental groups (P > 0.05). Conclusions: The use of the NaOCl/EDTA combination together with sonic or ultrasonic agitation improved the removal of TAP from the apical third. Background: Caries is the most common dental disease facing the world population. 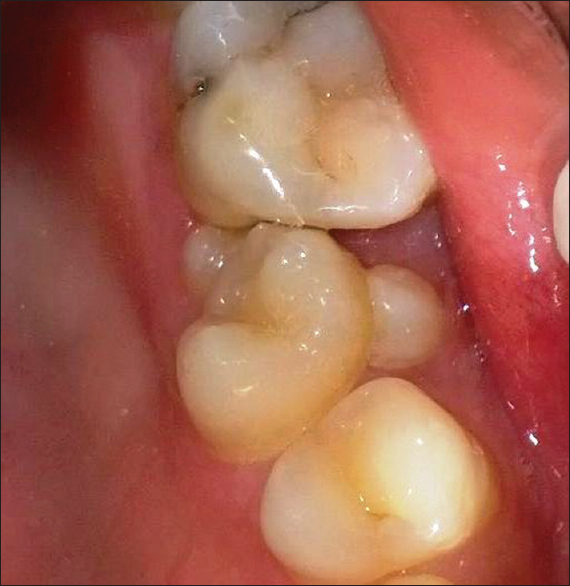 Caries can be prevented by remineralizing early enamel lesions. Aim: To evaluate remineralization efficacy of stannous fluoride (SnF2), casein phosphopeptide-amorphous calcium phosphate with fluoride (CPP-ACPF) and calcium sucrose phosphate (CaSP). 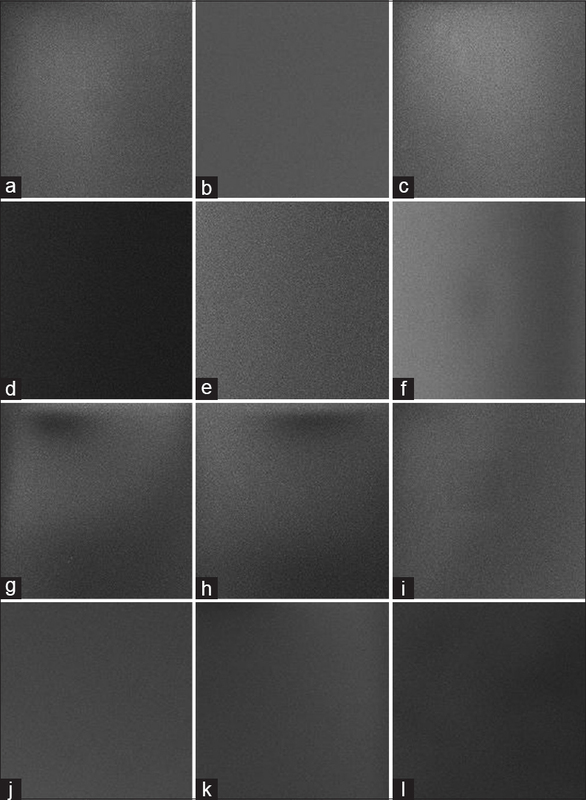 Materials and Methods: Fifty enamel samples were taken; they were divided into five groups (n = 10). Demineralization was carried out with Groups A, B, C, and E. Remineralization was carried out with Groups A, B, and C for 7 days using SnF2, CPP-ACPF, and CaSP, respectively. In Group D, no surface treatment was carried out, to mark as positive control whereas Group E was kept as negative control with only surface demineralization of enamel. Enamel microhardness was tested using Vickers's microhardness tester after 7 day remineralization regime. Statistical Analysis: One-way analysis of variance and post hoc Tukey tests were performed. Results: The mean microhardness values in descending order: Positive control > SnF2> CaSP > CPP-ACPF > negative control. Conclusion: All remineralizing agents showed improved surface remineralization. However, complete remineralization did not occur within 7 days. SnF2showed the highest potential for remineralization followed by CaSP and CPP-ACPF. Objective: The objective of this study was to evaluate the dissolution effectiveness of eucalyptus oil, orange oil, xylene, and distilled water on three different endodontic sealers. Materials and Methods: About 240 samples of root canal sealers (eighty for each sealer) were prepared and divided into four groups of 20 each for immersion in different organic solvents. Each group was further subdivided into two subgroups (n = 10) for 2 and 10 min of immersion time. The mean percentage of weight loss was determined for each sealer in each solvent at both time periods. Data were statistically analyzed by two factor analysis of variance and significance of mean difference was obtained by Tukey's post hoc test (P < 0.05). Results: The lowest level of solubility was observed for Adseal followed by Apexit Plus and Endomethasone N at both time periods in all solvents. Apexit Plus showed no significant (P > 0.05) difference in its dissolution in all the organic solvents except distilled water at both the time periods. 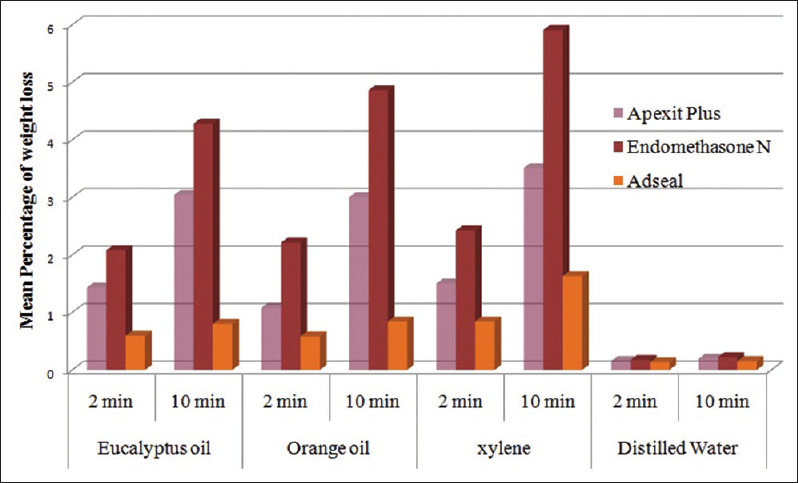 The solubility profile of Endomethasone N and Adseal did not differ significantly among eucalyptus oil, orange oil, and xylene at 2 min and between eucalyptus oil and orange oil at 10 min. However, at 10 min, Endomethasone N and Adseal showed a more pronounced solubility in xylene as compared to both eucalyptus oil and orange oil. Conclusions: In general, xylene was the most effective in dissolving root canal sealers than other organic solvents. Essential oils (eucalyptus oil and orange oil) were found similar in their ability to dissolve Apexit Plus and Endomethasone N.
Aims: This study investigated the effect of thermal fatigue on the shear strength of a range of tooth-colored restorative materials including giomers, zirconia-reinforced glass ionomer cement (GIC), nano-particle resin-modified GIC, highly viscous GICs, and composite resin. Materials and Methods: Twenty specimens of each material were fabricated in standardized washers (17 mm outer diameter, 9 mm internal diameter, 1 mm thick). The specimens were cured, stored in 100% humidity at 37.5°C for 24 h, and randomly divided into two groups of 10. Group A specimens were nonthermocycled (NT) and stored in distilled water at 37°C for 168 h. Group B specimens were thermocycled (TC) for 10,000 cycles (168 h) with baths X, Y, and Z adjusted to 35°C, 15°C, and 45°C, respectively. Each cycle had dwell times of 28 s in X, and 2s in Y/Z in the order XYXZ. 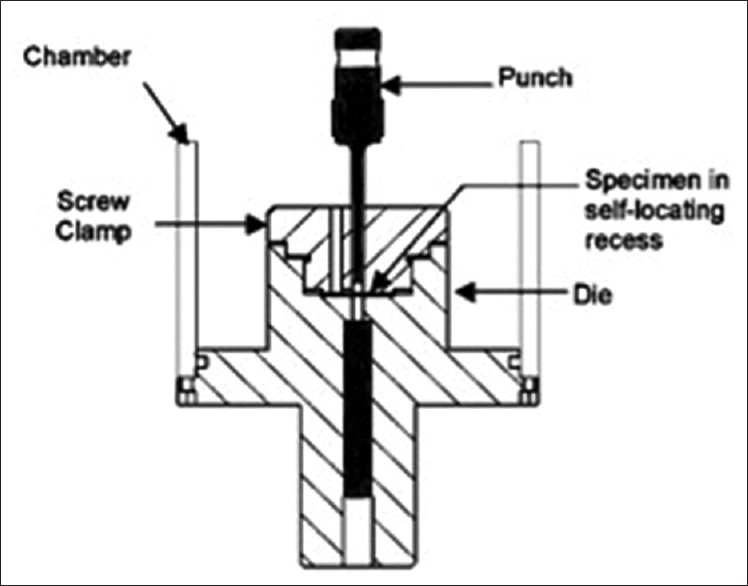 Specimens then underwent shear punch testing at a crosshead speed of 0.5 mm/min with a 2 kN load cell. Statistical analysis of shear strength was done using t-test and two-way ANOVA/Scheffe's post hoc test at significance level P< 0.05. Results: The effect of thermal fatigue on shear strength was material dependent. Except for the “sculptable” giomer (Beautifil II) and a highly viscous GIC (Fuji IX GP Fast), no significant differences in shear strength were generally observed between the NT and TC groups. For both groups, the composite resin (Filtek Z250XT) had the highest shear strength while the zirconia-reinforced (zirconomer) and a highly viscous GIC (Ketac Molar Quick) had the lowest. Conclusions: The effect of thermocycling on shear strength was material dependent. Thermal fatigue, however, did not significantly influence the shear strength of most materials assessed. The “sculptable” composite and giomer were significantly stronger than the other materials evaluated. Shear strength of the “flowable” injectable hybrid giomer was intermediate between the composite and GICs. Aim of this Study: The aim was to evaluate the efficiency of different sterilization methods on extracted human teeth (EHT) by a systematic review of in vitro randomized controlled trials. Methodology : An extensive electronic database literature search concerning the sterilization of EHT was conducted. The search terms used were “human teeth, sterilization, disinfection, randomized controlled trials, and infection control.” Randomized controlled trials which aim at comparing the efficiency of different methods of sterilization of EHT were all included in this systematic review. 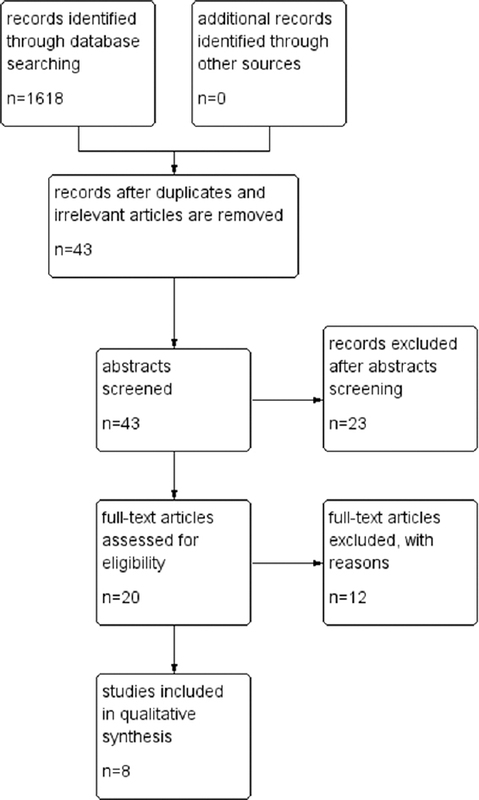 Results : Out of 1618 articles obtained, eight articles were selected for this systematic review. The sterilization methods reviewed were autoclaving, 10% formalin, 5.25% sodium hypochlorite, 3% hydrogen peroxide, 2% glutaraldehyde, 0.1% thymol, and boiling to 100°C. Data were extracted from the selected individual studies and their findings were summarized. Conclusion: Autoclaving and 10% formalin can be considered as 100% efficient and reliable methods. While the use of 5.25% sodium hypochlorite, 3% hydrogen peroxide, 2% glutaraldehyde, 0.1% thymol, and boiling to 100°C was inefficient and unreliable methods of sterilization of EHT. Objective: The purpose of the study was to investigate the efficacy of a new disinfectant to disinfect the dental unit waterlines. Materials and Methods: New dental unit waterlines were installed in 13 dental chairs, and biofilm was allowed to grow for 10 days. Disinfection treatment procedure was carried out in the 12 units, and one unit was left untreated. The dental unit waterlines were removed and analyzed using the scanning electron microscope (SEM) (TESCAN VEGA3 SBU). Result: On examination, SEM images showed that there was no slime layer or bacterial cells seen in any of the 12 cut sections obtained from the treated dental waterlines which mean that there was no evident of biofilm formation. Untreated dental unit waterlines showed a microbial colonization with continuous filamentous organic matrix. There was significant biofilm formation in the control tube relative to the samples. Conclusion: The tested disinfectant was found to be effective in the removal of biofilm from the dental unit waterlines. Background: The type of instrument affects the amount of debris extruded. The aim of this study was to compare the effect of retreatment systems and supplementary file application on the amount of apical debris extrusion. Materials and Methods: Forty-eight extracted mandibular premolars with a single canal and similar length were selected. The root canals were prepared with the ProTaper Universal system with a torque-controlled engine. The root canals were dried and were obturated using Gutta-percha and sealer. The specimens were randomly divided into four equal groups according to the retreatment procedures (Group 1, Mtwo retreatment files; Group 2, Mtwo retreatment files + Mtwo rotary file #30 supplementary file; Group 3, ProTaper Universal retreatment (PTUR) files; and Group 4, PTUR files + ProTaper F3 supplementary file). The extruded debris during instrumentation were collected into preweighed Eppendorf tubes. The amount of apically extruded debris was calculated by subtracting the initial weight of the tube from the final weight. Three consecutive weights were obtained for each tube. Results: No statistically significant difference was found in the amount of apically extruded debris between Groups 1 and 3 (P = 0.590). A significant difference was observed between Groups 1 and 2 (P < 0.05), and between Groups 3 and 4 (P < 0.05). Conclusions: The use of supplementary file significantly increased the amount of apically extruded debris. Aim: The aim of this study is to evaluate the effect of alcohol and nonalcohol containing mouth rinses on the color stability of a nanofilled resin composite restorative material. Materials and Methods: A total of 120 samples of a nanofilled resin composite material (Tetric N-Ceram, Ivoclar Vivadent AG, FL-9494 Schaan/Liechtenstein) were prepared and immersed in distilled water for 24 h. Baseline color values were recorded using Color Spectrophotometer 3600d (Konica Minolta, Japan). Samples were then randomly distributed into six groups: Group I - distilled water (control group), Group II - Listerine, Group III - Eludril, Group IV - Phosflur, Group V - Amflor, and Group VI - Rexidin. The postimmersion color values of the samples were then recorded, respectively. Results: Significant reduction in the mean color value (before and after immersion) was observed in nonalcohol containing mouth rinses (P < 0.001). Conclusion: All mouthrinses tested in the present in-vitro study caused a color shift in the nanofilled resin composite restorative material, but the color shift was dependent on the material and the mouthrinse used. Group VI (Rexidin) showed maximum color change. Aim : This in vitro study evaluated and compared the marginal adaptation of three newer root canal sealers to root dentin. 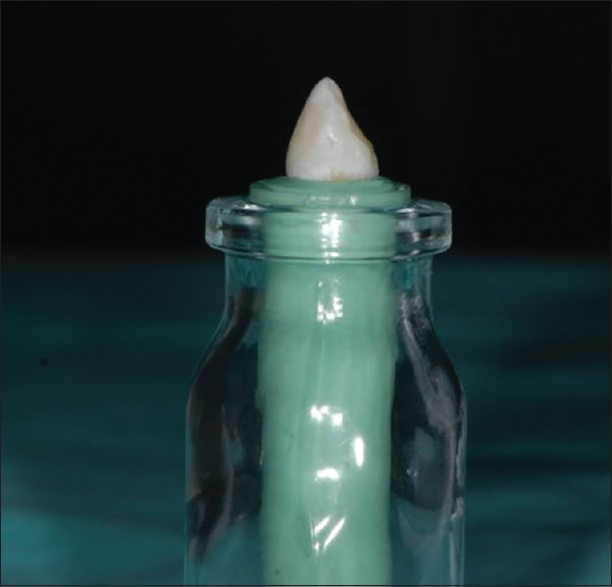 Materials and Methods : Thirty freshly extracted human single-rooted teeth with completely formed apices were taken. Teeth were decoronated, and root canals were instrumented. The specimens were randomly divided into three groups (n = 10) based upon the sealer used. Group 1 - teeth were obturated with epoxy resin sealer (MM-Seal). Group 2 - teeth were obturated with mineral trioxide aggregate (MTA) based sealer (MTA Fillapex), Group 3 - teeth were obturated with bioceramic sealer (EndoSequence BC sealer). Later samples were vertically sectioned using hard tissue microtome and marginal adaptation of sealers to root dentin was evaluated under coronal and apical halves using scanning electron microscopy (SEM) and marginal gap values were recorded. Results : The data were statistically analyzed by two-way ANOVA and Tukey's multiple post hoc test. The highest marginal gap was seen in Group 2 (apical-16680.00 nm, coronal-10796 nm) and the lowest marginal gap was observed in Group 1 (apical-599.42 nm, coronal-522.72 nm). Coronal halves showed superior adaptation compared to apical halves in all the groups under SEM. Conclusion : Within the limitations of this study epoxy resin-based MM-Seal showed good marginal adaptation than other materials tested. Background: The present study was undertaken to evaluate the most suitable restorative for badly mutilated endodontically treated teeth. Aims: To evaluate and compare the fracture resistance of endodontically treated premolars restored with conventional nanohybrid, silorane composite with glass fibers and newer fiber-reinforced composite in mesio-occluso-distal (MOD) cavities. 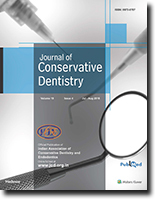 Materials and Methods: Sixty extracted human maxillary premolars were selected. Fifteen intact teeth served as positive controls (Group 1). Endodontic therapy was done in the remaining 45 teeth. MOD cavities were prepared in all the teeth with standardized dimensions and were randomly divided into three groups (Group 2 - nanohybrid + glass fibers, Group 3 - silorane + glass fibers, and Group 4 – fiber-reinforced composite). Restorations were done for all groups. Fracture resistance was measured by Instron universal testing machine. Statistical Analysis Used: One-way anova test and Tukey's post hoc test. 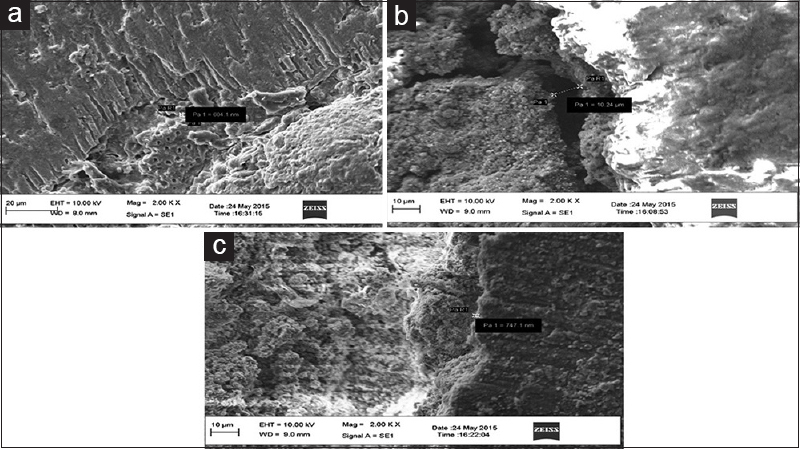 Results: Highest fracture resistance was shown by intact teeth group followed by fiber-reinforced composite, nanohybrid, and silorane, respectively. Statistically Significant difference was revealed by anova test (P < 0.0001) and Tukey's post hoc test (P < 0.0001). Conclusions: Among the experimental groups, fiber-reinforced composite showed the highest fracture resistance. Statistically significant difference was observed for all the groups. Aim: To compare the smear layer and debris removal in root canals instrumented with two different kinematic motions after ultrasonic and sonic irrigation activation. Materials and Methods: Eighty freshly extracted teeth were selected for the study and randomly divided the samples into two groups (n = 40) for instrumentation with either rotary ProTaper NEXT (PTN) or reciprocating WaveOne (WO) file systems. These (n = 40) were further divided into two groups (n = 20) where the final irrigant was activated using either Ultrasonics (Passive Ultrasonic Irrigation; PUI) or Sonics (EndoActivator; EA). Group 1: PTN + EA; Group 2: PTN + PUI; Group 3: WO + EA; and Group 4: WO + PUI. During instrumentation, a total of 4 ml of 5.25% NaOCl was used for irrigation. The final irrigation protocol included NaOCl and Smear Clear Solution. The samples were processed by scanning electron microscopic examination for debris and smear layer scoring, and statistical analysis was done. Results: The mean debris and smear layer score was less in the group instrumented by PTN with sonic activation of the irrigant. Conclusion: A combination of PTN instrumentation with sonic irrigation activation by EA is more effective in debris and smear layer removal in the groups tested. Traditional configuration of maxillary second premolars has been described to have two cusps, one root and one or two root canals. The endodontic literature reports considerable anatomic aberrations in the root canal morphology of maxillary second premolar but the literature available on the variation in cuspal anatomy and its relationship to the root canal anatomy is sparse. The purpose of this clinical report was to describe the root and root canal configuration of a maxillary second premolar with four cusps. The treatment of choice for necrotic teeth with immature root is apexification, which is induction of apical closure to produce more favorable conditions for conventional root canal filling. The most commonly advocated medicament is calcium hydroxide although recently considerable interest has been expressed in the use of mineral trioxide aggregate (MTA). MTA offers the option of a two-visit apexification procedure so that the fragile tooth can be restored immediately. However, difficulty in placing the material in the wide apical area requires the use of an apical matrix. Materials such as collagen, calcium sulfate, and hydroxyapatite have been used for this purpose. This article describes the use of resorbable suture material to form the apical matrix which offers many advantages over the contemporary materials.